I take notes 3 different ways. It depends on the class, and what my schedule looks like for the day. 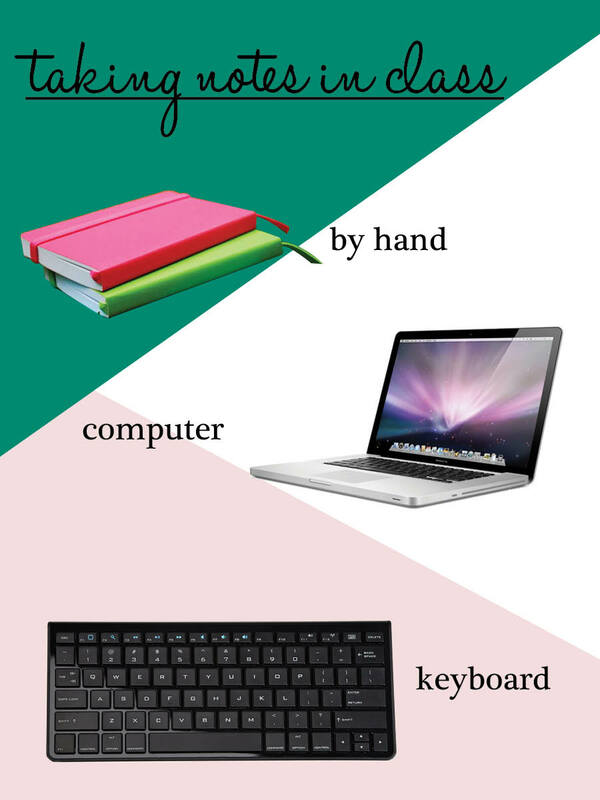 Generally speaking, I hate carrying my computer around. I think it’s too darn heavy! But occasionally, it’s the best tool for the job. Handwritten | This is my favorite method, by far. I prefer to handwrite all of my notes, but sometimes a professor talks too fast! I have one notebook per class to keep everything straight. Have a class that uses a lot of outline style notes? Try a notebook of graph paper! It will help keep everything lined up. Computer | Sometimes you’ll end up with a professor that can talk a million miles a second. It’s hard to keep up, even if you type pretty fast! For these classes, I don’t even try to handwrite notes, it’s a lost cause in my head. Keyboard | If you have to type notes, but don’t want to carry around a computer this is my favorite solution! I bought a bluetooth keyboard from amazon & hooked it up to my phone. I use the Google Docs app & can type like I have a computer without the extra weight! If you handwrite your notes, type them up once a week. It will help you review what was talked about in class & prepare for your exams! Use Google Drive for all of your notes. You can create a folder for each class & you can access your notes from anywhere. No tracking down missing files! They’ll also be backed up to the cloud, so if your computer crashes you’ll be good. You can also access all of your files on your iPhone with their app. Take notes in different colors. I like to write definitions in a different color so they are easier to pick out when I’m making flash cards. Use highlighters to study! If your professor provides notes or outlines before class, print them out & look at them! You’ll be more prepared & it will be easier to take notes.